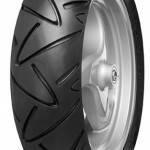 Proven tread pattern design taken from the test winning ContiRoadAttack 3 sport touring tyre, which gives great grip at all angles of lean in the wet, and ensures more even wear during the life of the tyre. Updated compound for extremely fast warm up times, even in colder weather conditions. Agile profile for nimble handling, ideal for riders is busy towns and inner cities. Excellent grip on wet and dry roads. New-edge, sporty tread design for effectively clearing water on wet roads. Sizes for scooters from 50cc to 500cc. Selected sizes are also available in white wall. 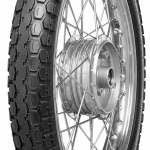 Light handling thanks to the latest tyre profile technology. Tread pattern ejects water very effectively for safe riding in the wet. Durable compound delivers high mileage. 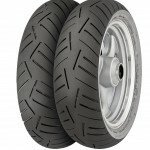 Renowned moped tyre with open block tread. Excellent ride qualities in all weather conditions, including winter use. 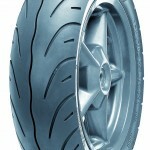 This tyre is also available in white wall.